In a recent LSE blog, Donato Di Carlo presents empirical evidence for what he considers a ‘quiet rebalancing’ of the German economy. Using 2010 as a reference point, he bases his argument on a comparison of the growth of real unit labour costs, real expenditures, and import-export relations of Germany vis-à-vis other European countries, and interprets the trends as a process of readjustment. However, given that the accumulation of imbalances began with the onset of the European Monetary Union (EMU), a longer-term perspective is needed to judge whether a rebalancing process has indeed taken place. Moreover, if we consider that drastic austerity measures were imposed on several crisis-ridden countries in the EMU, the apparent readjustment of intra-European imbalances can be more convincingly interpreted as a result of the contraction in the European periphery. As Di Carlo rightly points out, the scale of the imbalances within the Eurozone has been at the core of the academic and political debate. The most common criticism of Germany’s excessive surpluses usually refers to the wage restraint policies that the government implemented from the onset of the EMU in the late 1990s. With unit labour costs undercutting the inflation target set by the European Central Bank (ECB), Germany has amassed substantial gains in its price competitiveness through an effective depreciation of its real exchange rate. This, in turn, enabled an accumulation of surpluses, which would have been impossible under a fluctuating exchange rate regime and an appreciating currency. The problematic implications of the competitive divergences across the Eurozone have been widely studied and are generally well understood. Now, the question about the viability of the Eurozone hinges upon the rectification of the accumulated imbalances. So how should we think about competitive divergence when we work with empirical data? First, it is important to acknowledge that, by definition, the competitive gains of one country will equal the competitive loss of another, as competitiveness itself is a relative concept. A statement such as ‘Germany appreciated vis-à-vis its European neighbours’ necessarily implies that the latter have depreciated vis-à-vis Germany. Whilst this may appear prima facie tautological, it suggests that it is ontologically impossible for all countries to improve their competitiveness at the same time. As a corollary, the question of whether a country ‘rebalances’ its economy, or, to be more accurate, the competitiveness of its economy, depends on the point of reference we take. Arguably, in a monetary union, the only objective measure for this is the development of unit labour costs in relation to the common inflation target, as this indicates which countries were living above and which countries were living below their means (i.e. productivity). Looking at the data for the EMU, illustrated in Figure 1 below, we find that a German adjustment is non-existent, as the size of the gap between unit labour costs and the inflation target remains excessively high (meaning that prices of German goods are well below the level they should be, based on the country’s productivity). 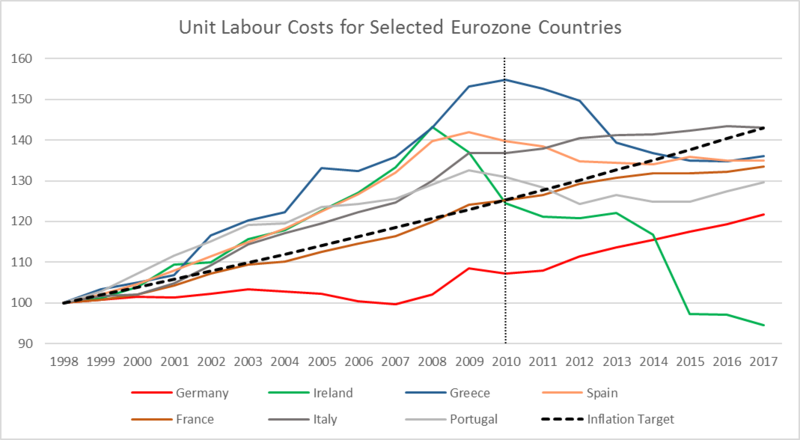 Since the outbreak of the crisis in 2010, however, the austerity-driven contraction in southern European economies led to a convergence of unit labour costs towards the deflationary path of Germany. If 2010 is selected as the base, therefore, it is to no surprise that Germany’s unit labour costs have risen faster than elsewhere in Europe. Moreover, it becomes obvious that this deflationary convergence cannot be interpreted as a result of Germany rebalancing its economy. The same applies to import and export relations. The data in Figure 2 and Figure 3 show that most of the ‘quiet rebalancing’ of the German economy had nothing to do with fundamental changes to the country’s growth model. Any sustainable form of rebalancing would need to involve re-inflation in Germany, led by a surge of unit labour costs, a concomitant appreciation of the real exchange rate and an increase in imports from its European trading partners (as well as a decline of its market share, as further discussed below). 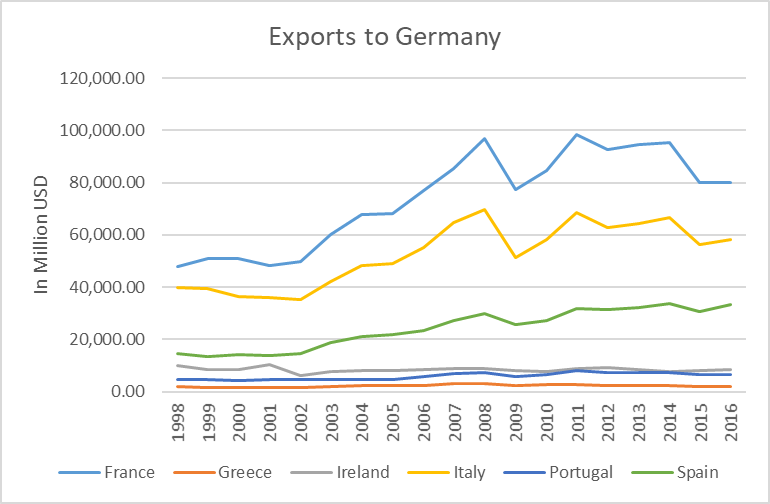 What the above data show, however, is that the downturn in countries affected by the Eurozone crisis led to a decline in imports from Germany (rather than an increase in exports). 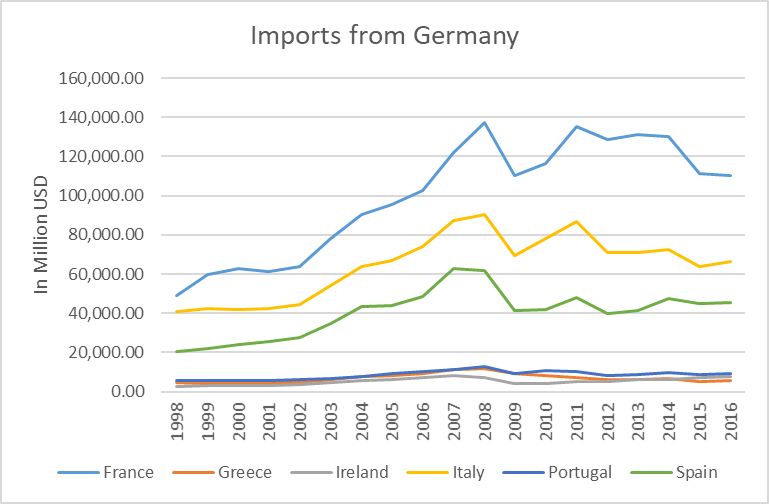 From its peak in 2008, Italy’s imports from Germany receded by 2016 by almost a third (all figures USD; from $90 billion to $66 billion), imports in France declined from $137 billion (2008) to $110 billion (2016), in Spain from $62 billion (2008) to $45.6 billion (2016), and in Portugal from $12.6 billion (2008) to $9 billion (2016). None of the selected countries managed to balance its bilateral trade in goods with Germany by 2016, with bilateral deficits ranging from over $30 billion in France to more than $2 billion in the much smaller Portuguese economy. More generally, however, it is methodologically inappropriate to try to identify a rebalancing process by solely referring to the importance of Germany as an export destination. The fact that Germany accounts for roughly 30 per cent of the entire Eurozone’s output makes it inevitably a significant export destination in Europe. What matters is the difference between imports and exports. The map below indicates that, in fact, not only the countries discussed above, but nearly all of Germany’s trading partners have run bilateral deficits in the trade of goods (those with such a bilateral deficit are coloured in red, the measure I used to indicate the extent of the imbalances was introduced in my last LSE blog). Note: Compiled by the author. Especially around the time of the financial crisis, it appears that these imbalances peaked across the entire continent – with very few exceptions (Ireland, the Netherlands, and Norway). In other words, the curing of the “sick man of Europe” led to a fever elsewhere. After the onset of the Eurozone crisis, the imbalances receded mainly due to a reduction of imports in most countries, which explains the more balanced picture from 2010 onwards. Note, also, that a substantial part of the surpluses of Central and Eastern Europe in bilateral trade with Germany can be attributed to large inflows of direct investments, as these countries effectively function as a cheap workbench for much of German industry. Finally, Germany’s superior competitiveness is best illustrated by the rising German share of Eurozone exports to world markets (including the EU itself). This measure captures the third market effects of Germany’s real exchange rate, which are often ignored and/or hard to quantify in economic analyses. It also implies that an increase in the German share necessarily entails a declining share of other EMU member states. 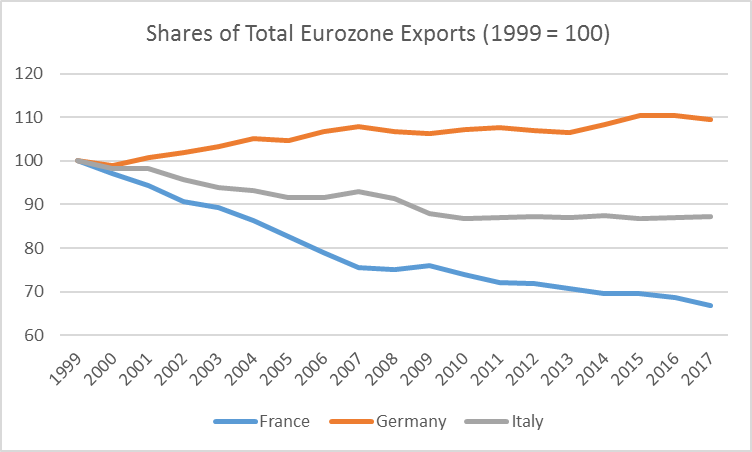 Figure 5 below illustrates the development of market shares for the three biggest Eurozone economies: Germany, France, and Italy. It shows that both of Germany’s big neighbours, which used to have a strong industrial base, faced severe declines in their respective shares: something that, without a doubt, can be attributed to German competitiveness. Note: Data from IMF Direction of Trade Statistics; author’s own calculations. In sum, therefore, Germany’s ‘quiet rebalancing’ has in fact been so quiet that is has not taken place. There is no doubt that Germany has thus far neither proposed nor conducted any policies that would lead to such a desperately needed process. The Grand Coalition continued its highly restrictive fiscal policies: what Guntram Wolff, director of Bruegel, so nicely described as “the German allergy to investments”. Moreover, German economist Heiner Flassbeck has shown how the intellectual edifice of Germany’s coalition agreement continues to be dominated by mercantilist ideas. The only option for both the Christian Democrats (CDU) and Social Democrats (SPD) to increase the wealth of nations is, in their view, through high competitiveness and surpluses in the external sector (although this ideological stance is common across all parties in Germany). It almost seems as if German policymakers copied ideas that were popular roughly 350 years ago. In 1664, Thomas Mun, a former director of the East India Company, laid out his vision for a prosperous Britain: ‘The ordinary means […] to increase our wealth and treasure is by [foreign trade], wherein [we] must ever observe this rule; to sell more to strangers yearly than [we] consume of theirs in value.’ Germany has perfected this principle from the 17th century under the EMU. If the Eurozone is to survive, one cannot expect Germany to function as a “fixer of last resort”, but rather, it must be remembered that if it does not act as the primary fixer, the breaking apart of the Eurozone is just a matter of time.